Researchers at Hong Kong Baptist University are conducting a study on board China's spacecraft Tianzhou-1 in order to understand the effect of the "CKIP-1" gene on bone formation under microgravity in space. The School of Chinese Medicine (SCM) of Hong Kong Baptist University (HKBU) is conducting a space life science study on board China's first cargo spacecraft, Tianzhou-1, which was launched last month. HKBU is the only higher education institution from outside of Mainland to conduct a scientific research project onboard Tianzhou-1. The HKBU team investigates the effect of the "CKIP-1" gene on bone formation under microgravity conditions in space. Under microgravity, bone loss is several times faster than on Earth, posing a serious health threat to astronauts, who therefore cannot stay in space for long periods of time. 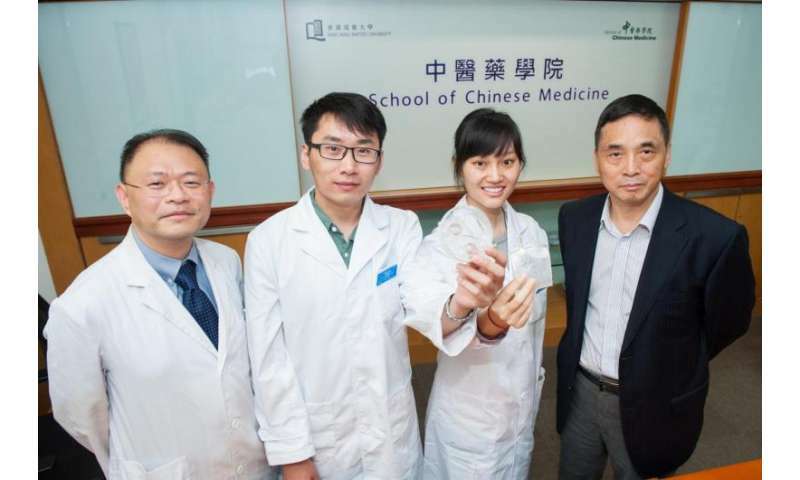 The HKBU team hopes that this study can lead to the formulation of a set of protective measures and treatment strategies as well as the discovery of new drugs to prevent or treat bone loss resulting from space travel. It could also serve as reference for the development of health care and therapeutics for the ageing population. The HKBU team is led by Professor Lyu Aiping, HKBU's Dean of Chinese Medicine and Director of the Law Sau Fai Institute for Advancing Translational Medicine in Bone and Joint Diseases (TMBJ), and Professor Zhang Ge, Associate Director of TMBJ, Associate Director of SCM's Teaching and Research Division, and Director of the Technology Development Division, with Post-doctoral Research Fellow Dr Liang Chao and Senior Research Assistant Miss Wang Luyao as team members. Professor Lyu Aiping said this is another important contribution made by HKBU to the Mainland's major scientific research initiatives after its participation in the first deep-sea expedition of the manned submersible Jiaolong in 2013. This new contribution not only recognises HKBU's and Hong Kong's research strength in related areas, but also is a great source of encouragement to members of the Chinese medicine and higher education sectors. Professor Zhang Ge said the quality of research of TMBJ on bone and joint has reached the top international level. TMBJ members have in recent years published a number of research papers in prestigious academic journals such as Nature Communications and Nature Medicine. He hopes their project can bring a breakthrough in this related area of research. The "CKIP-1" gene in osteoblast (bone forming cell) could specifically interact with "Smurf1" genes in the cells to inhibit cell activity, thereby slowing down or hindering bone formation. The research team led by Professor Lyu and Professor Zhang further found that the aberrant elevated "CKIP-1" expression in osteoblasts could inhibit bone formation and contribute to the reduction in bone formation during ageing as well as in the development of glucocorticoid-induced osteoporosis. Nevertheless, the function of "CKIP-1" on the process of bone formation reduction caused by microgravity in space is still not yet known. The team has placed osteoblast in which "CKIP-1" genes were silenced on board the Tianzhou 1 for further research and is monitoring the effects of "CKIP-1" on osteoblast. To prepare for the launch of Tianzhou 1, Dr Liang Chao and Miss Wang Luyao of the HKBU team participated in a number of life science experiments at ground level organised by the National Space Science and Application Centre of the Chinese Academy of Sciences. These experiments included simulated vibration tests, bio-compatibility tests and simulated microgravity experiments as well as systematic matching experiments and rehearsals. Tianzhou 1 was launched at the Wenchang Space Launch Centre in Hainan. Entitled "Research on the impact that microgravity has on the proliferation and differentiation of cells", the space life science study on Tianzhou-1 is led by Northwestern Polytechnical University in collaboration with HKBU, Tsinghua University, Zhejiang University, the Academy of Military Medical Sciences, and the Institute of Zoology of the Chinese Academy of Sciences. The project consists of eight sub-projects and HKBU is responsible for the "CKIP-1" one.